Textkernel helps bring supply and demand in the labour market together even better and faster by offering extensive bi-directional matching. With Match! 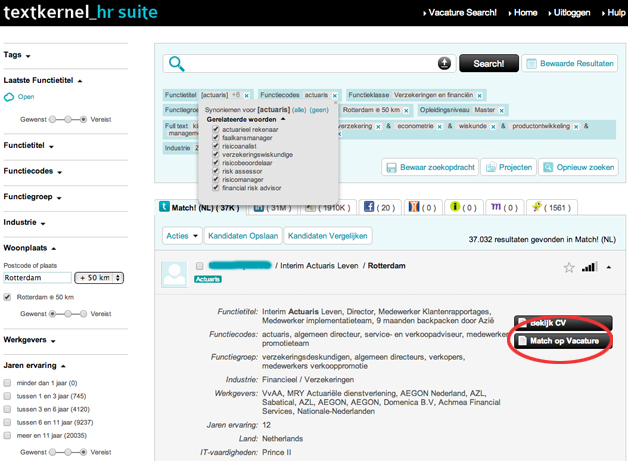 and Jobfeed (Textkernel’s Big Data tool for jobs) you can match all profiles in your database with your own jobs ánd with all online jobs found by Jobfeed. On the other hand, you can match jobs to profiles in your own databases and external databases, job boards and social media. The opportunity to match both ways with all jobs, increases the chance of making that relevant match fast.